Washington State has made the historic move of asking residents to volunteer in the battle against the wildfires raging across the state. President Barack Obama declared the fires a federal emergency on Friday. The call for volunteers is a first for the state, but numerous wildfires have forced evacuations of towns and placed severe strains on resources. Specifically, the Washington State Department of Resources (DNR) wants to find people who can operate heavy machinery such as bulldozers and backhoes. "If people want to help, we'd like them to contact our coordinators so we can work on getting them safely and appropriately involved," said Commissioner of Public Lands Peter Goldmark, according to the Associated Press. "We appreciate all offers of qualified and trained support. Safety for everyone is our highest priority." Two coordination centers have been established in the state. Already, the DNR says it is being flooded with people who want to pitch in. While the DNR is looking for qualified applicants, they will not be sent out to the front lines of a wildfire unless professional firefighters are there to ensure proper safety measures are in place. Help is also arriving to the state from Australia and Canada, the latter of which is also fighting fires near the Washington-Canada border. The move comes as the Washington fires were declared a federal emergency. The emergency declaration, signed by President Obama, enables the Federal Emergency Management Agency to offer additional assistance and resources. These include emergency power generation resources, properly functioning equipment, health and safety inspections and more. The order applies to the counties of Asotin, Chelan, Douglas, Ferry, Klickitat, Okanogan, Pend Orielle, Skamania, Spokane, Stevens, and Yakima. Additionally, it will also enable aid to flow to the Colville, Spokane, Kalispel, and Yakima Native American tribes. Twenty-eight large, active fires were reported to be burning in Oregon and Washington alone Friday morning, the Chinook Observer reported, none of which were contained. A series of several fires burning in Okanagan County, known as the Okanagan Complex, had ripped through 91,000 acres by Friday morning and was only 38 percent contained, the outlet stated. This set of fires is larger than the cities of Seattle and Tacoma combined, according to King 5 News. More tragically, the blaze was responsible for the death of three US Forest Service firefighters on Wednesday, all of which were identified Friday as Tom Zbyszewski, 20, Andrew Zajac, 26, and Richard Wheeler, 31. Four other firefighters were injured, including one in critical condition as of Thursday and two that were released. It’s unclear how the fourth one is doing. 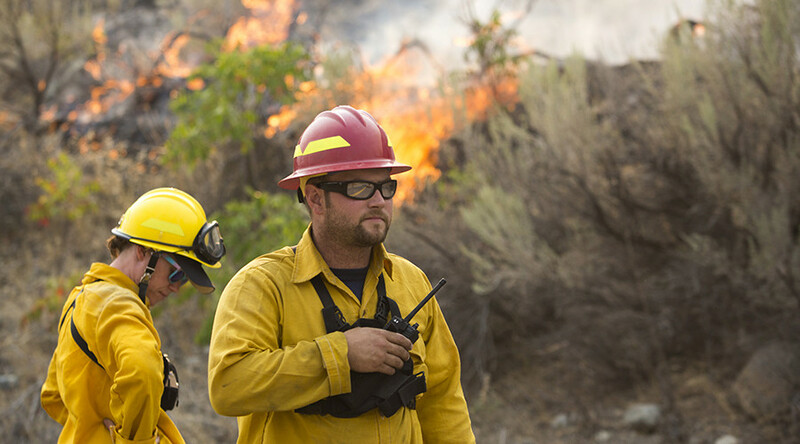 The firefighters were involved in combating the fire when a “vehicle incident” occurred and they were overtaken by flames, Okanogan County Sheriff Frank Rogers said, according to the LA Times. Earlier this week, some 3,000 people in the towns of Twisp and Winthrop were evacuated over neighboring wildfires. Numerous homes have also been lost, though officials don’t know how many.